Even if it doesn’t seem like it at the moment, spring is just around the corner and we will soon be dusting off our mowers for the first mow of the year. Servicing your lawnmower is best left to a professional, however with a small amount of knowledge and the right tools, there is no reason why you can’t do it yourself at home. The following steps will point out what should be done during a lawnmower service, for more comprehensive instructions consult a professional or your lawnmower’s manual. Blades – Whether your mower is petrol or electric, the blades are the most important component. Blunt blades can cause damage to turf, cut unevenly and make your lawnmower much less efficient. Clear the mower decks – Ensure that your clean out any clippings and dirt from around the mower deck and remove all the covers to make sure that each mower component is thoroughly cleaned. On electric mowers, keep the vents free from clippings which might restrict the airflow and make sure all water is kept away from the electrical components. Keep things running smoothly – For electric mowers lubricating the wheels is the only maintenance required, however on petrol-powered models, the engine will also need to be serviced. 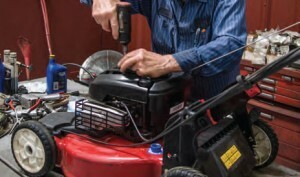 For more involved procedures such as spark plugs and replacing pull starter cords refer to your mower’s manual for the particular maintenance schedule. Here at Ivinghoe Turf we are lawn turf specialists and we have been growing and supplying high quality garden turf to our customers across Hertfordshire, Bedfordshire and Buckinghamshire for over three decades. During this time we have built up a strong reputation as one of the leading suppliers in the area providing an unrivalled level of service to our clients.